NOTE: Topaz Labs has released an updated version of Star Effects 1.1 which contains some new enhancements as well as bug fixes. This is a free upgrade to existing license owners. 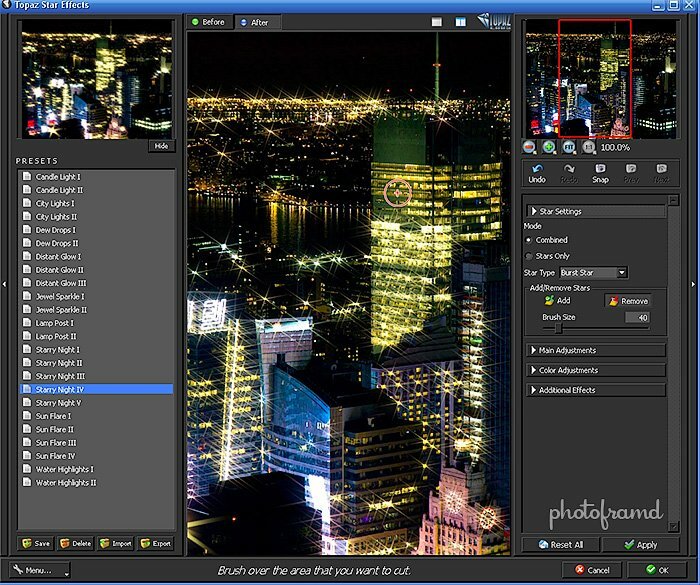 Download latest version direct from Topaz here. Topaz Star Effects starts you off with 25 presets. But, the fun is in experimenting. In the Main Adjustments tab, you can adjust the Threshold to control which light sources are turned into stars. Want a few stars? Lower the Threshold. Want lots of stars? Increase the Threshold. You can refine the overall effect further by using the Brush in the Star Settings tab to remove/add stars exactly where you want them. Also in the Star Settings, you can adjust the overall look of the star from a natural burst to a stylized vector look. Also in the Main Adjustments tab, you can adjust the star size, star angle, number of points, spread and the overall luminance of the stars. Under Additional Effects, you can even add a burst within a burst, glow and ring flare. You can adjust the overall color, saturation of the star and even add a rainbow prism effect. You can even mix all of the effects by using the Apply button between setting changes. It’s so Easy! If you are a Photoshop perfectionist, you may want to apply the star effect to a new layer with a black background (by using the Stars Only setting under the Star Settings). Just change the Layer Blending Mode in Photoshop to Screen to see the effect directly on the photo. You can then add a Mask to control the application or create a selection by selecting black in the color range and inverting the selection. So many options! 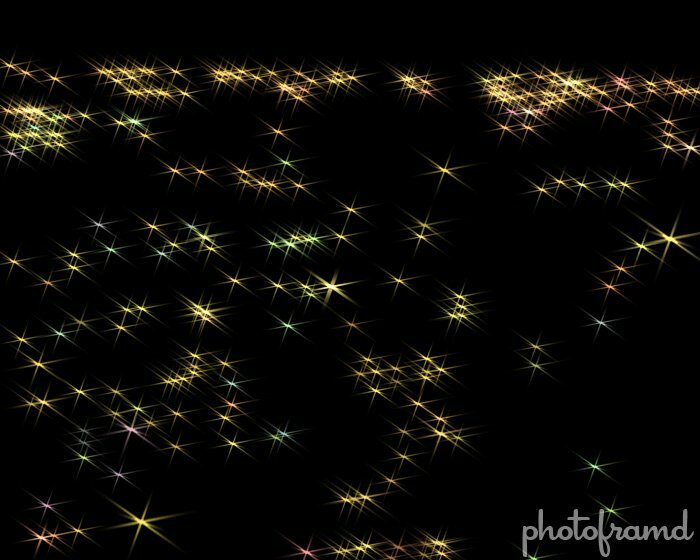 Topaz Star Effects is brand new and ready for you to download. This is also the first new filter NOT to be included in the Topaz Bundle; so it will require a separate purchase. The filter is regularly $29.99 but can be purchased for only $19.99 when you use the coupon code TopazStars (expires 2/15/12). Topaz has scheduled a series of Webinars for Star Effects so that you can see the plugin in action. But, I warn you — once you see it, you will want it! 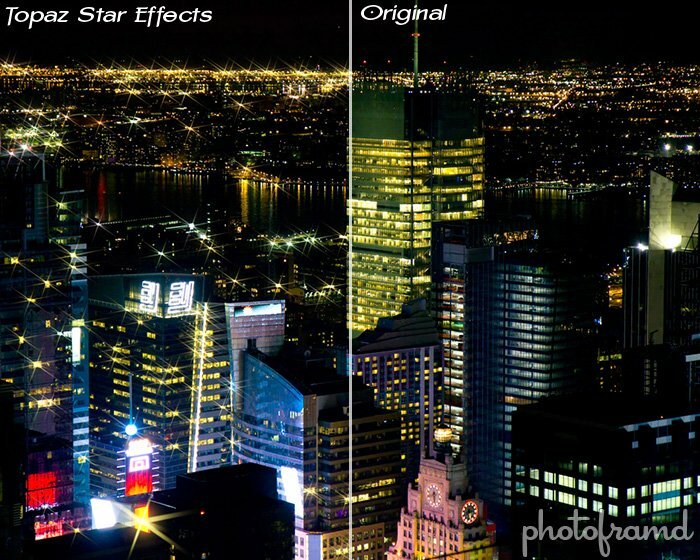 I have not used a Star Filter in over 15-years. The problem is there is no control – every light source turns into a star and about the same size. It might have a WOW factor at first, but to a trained photographer it screams “novice”. Creating a real star is a matter of stopping down to the smallest aperture possible. The number of points will depend on the number of blades in the lens. Much more subtle and realistic, but still no control over which light sources. At least the size of the star will be appropriate for the size of the light source.